The 1930s and 40s in Germany are remembered as a particularly dark time for humanity, as millions of lives- Jews, the mentally retarded, and other so-called undesirables- were lost to the twisted ethos of National Socialism. One aspect that is difficult to understand today is the way that many common citizens, including the German Evangelical Church, were complicit in the Nazis’ rise- from pledging allegiance to Hitler to adopting the Aryan Paragraph and the Nuremberg Laws. 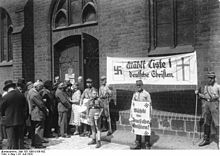 We are posting a series of articles considering five mistakes made by the German Christians in the years leading up to World War II. It is easier said than done to put these words into action, which was exactly the conundrum facing Dietrich Bonhoeffer and the Confessing Church. What is expected of the church when facing evil? Is it enough to remain a pure, separate bulwark, remaining untainted by the evil outside the walls? Is God only concerned with our beliefs and religion, or with our actions as well? Is he God of the church only, or of the whole world? “The levels of confession and of resistance could no longer be kept neatly apart. The escalating persecution of the Jews generated an increasingly intolerable situation, especially for Bonhoeffer himself. We now realized that mere confession, no matter how courageous, inescapably meant complicity with the murderers, even though there would always be new acts of refusing to be co-opted and even though we would preach ‘Christ alone’ Sunday after Sunday. During the whole time the Nazi state never considered it necessary to prohibit such preaching. Why should it? Neither I nor Bonhoeffer is advocating a do-whatever-you-want lifestyle; I do, however, believe that legalism is wholly insufficient for pleasing God. The Reich Church allowed legalism and a theology divorced from praxis to creep in, and when National Socialism arrived, they were content to rest on their laurels and avert their eyes from the evil around them.